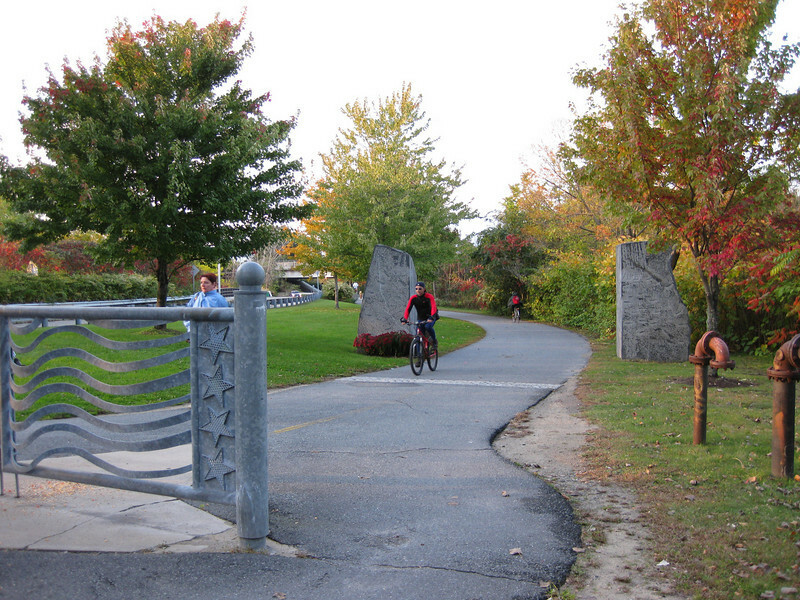 One $48,000 TE grant in 1995 funded this artistic gate and the rock sculptures in the background at the trailhead in Cambridge. The Minuteman Bikeway is an 11-mile rail-trail that connects Cambridge with Bedford, passing through Lexington and Arlington. This project converted an abandoned railroad, which provided passenger and freight service from 1846 to 1981 (Passenger service discontinued in 1977), into a multi-use bikeway. Over $2 million in federal TE funds were awarded to four projects that leveraged a total local match of nearly $530,000 to construct portions of the trail. Connecting to the Alewife T Station in Cambridge, this bikeway serves as a regional connector providing pedestrians and bicyclists with access to subway and bus service. In addition, plowing in the winter makes the rail-trail accessible year-round. The Rails-to-Trails Conservancy inducted the Minuteman Bikeway into the national Rails-Trail Hall of Fame in 2008. An interactive Google Map is available here.